After getting a couple of flashing lights working on a microprocessor, the next fun project is generally building some kind of Matrix. 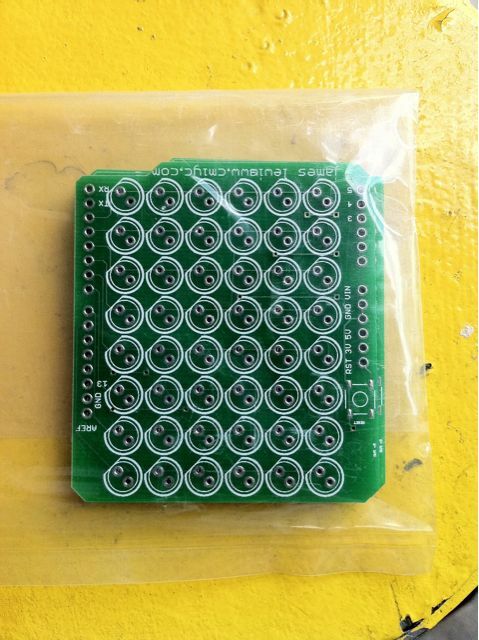 At first I built a 5×5 LED matrix which was relatively simple to solder together. When trying to make one much larger, the task because significantly more complex. 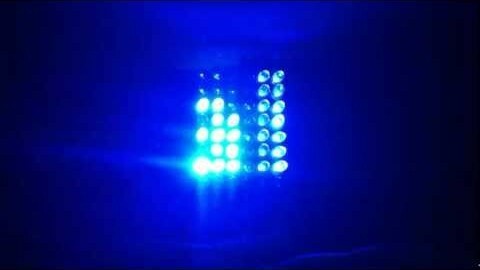 That’s when I decided to build a LED Matrix Shield for the Arduino which did not use Charliplexing, like the LoL shield. I wanted something that was simpler to understand and (ultimately) code for. Unfortunately, 5mm LEDs means 8 columns x 6 rows, instead of the traditional 8×8. The PCB for my very first Arduino shield arrived today from BatchPCB. At first glance everything looks good. The silkscreen with my name and web address didn’t come out so well but that was probably my fault on trying to fit in too much. Looking forward to assembling then with some Blue LEDs!